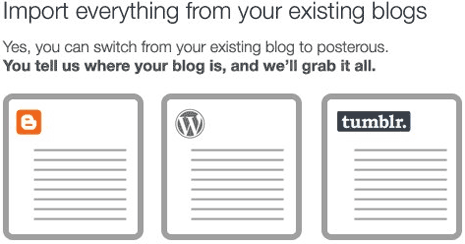 Posterous has launched new import feature that allows you to import any old, new forgotten blogs on Blogger, WordPress or Tumblr blogging platform to Posterous blogging service. You can import all your blog posts including photos and files from old blog on different platform to your brand new or existing Posterous blog. To get started, goto import pageand enter your blog details. Importer feature will grab old blog posts into exisiting posterous blog or create a new blog. You can import old posts one by one or take them all in one go. So if you are feeling bored on Blogger, WordPress or Tumblr – why not tumble on Posterous for your daily blog posting fill?